North Coast anglers will be bracing for bad news as we begin to enter into the salmon harvest regulatory process for 2017. 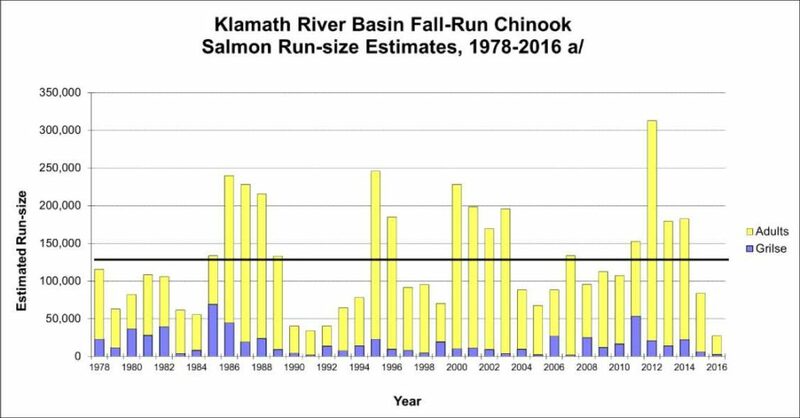 After multiple years of drought, the 2016 Klamath Fall Chinook adult returns hit historic lows, recording the lowest overall in-river run in 38 years of extensive record keeping and the third lowest natural spawner escapement during that same period of time. This past fall, only 27,353 total spawning adults returned – which includes hatchery fish from both Trinity River and Iron Gate Hatcheries. Even more alarming is the fact that only 19,948 of these fish were considered “natural spawners”. This is WELL BELOW the conservation floor of 40,700. Remember, if a stock fails to meet the minimum spawner objective for three consecutive years, an overfishing review can be triggered. This will be year two of not meeting the floor. So what does this mean for our season? For the purposes of population estimates and harvest, fishery managers divide the ocean into different zones. This helps to manage (and in some cases protect) specific stocks of fish where they most commonly occur. The area off the coast of northern California and southern Oregon between Humbug Mountain and Horse Mountain is known as the Klamath Management Zone (KMZ). The greatest impacts on Klamath River stocks occur within the KMZ. Our ocean seasons are crafted to ensure there are plenty of Chinook salmon returning to the Klamath River each fall. On March 1, Jim Yarnall and I will find out what the ocean abundance forecast is for not only KMZ fish, but Central Valley fish as well. These figures are derived from the age composition of returning 2016 spawners, along with some other factors. My back-of-envelope calculation suggests that there will be less than 2,000 Klamath Chinook available for harvest coast wide. The tribes will take half off the top so now we are looking at fewer than 1,000 fish to divide between in-river, commercial, and sport – whether targeted or incidental. As you can see – we aren’t going to have many fish, if any, to work with. Anywhere that has potential to “contact” a Klamath fish will be impacted, especially the southern Oregon coast and northern California, including Fort Bragg. Jim Yarnall was recently appointed to PFMC’s Salmon Advisory Subcommittee as the California Sport Representative. This is an honor for Jim and an opportunity for HASA to have a voice at the table. 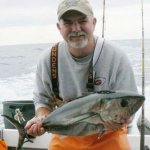 Jim will be representing all of California’s recreational salmon anglers not just HASA. Jim and I will be working together to see if there’s anything to salvage for this upcoming ocean salmon season. Salmon populations are cyclic and things are going to be tough for a few years. The good news is there’s lots of snow pack and rain within the Klamath Watershed. Rivers and streams need periodic flushing to remain healthy and viable ecosystems. While things will be tough for this year and perhaps the next few, the table is being set for better days ahead. Tight Lines!